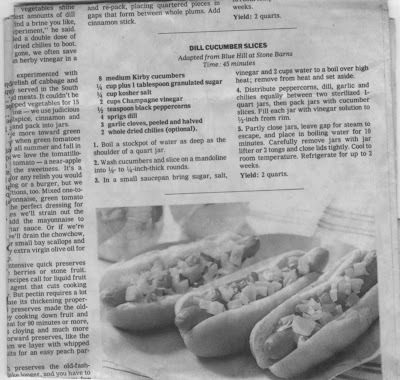 My friend Jenny just sent me this scan of a New York Times recipe for Dill Cucumber Slices adapted from Blue Hill at Stone Barns. It’s fancy with champagne vinegar, but doesn’t look difficult. If you drag and drop the image to your desktop and set the page orientation to landscape, it prints out legibly.